These Mamluk tiles reflect the growing impact of Chinese ceramics, most evident in the colour scheme which imitates Chinese blue-and-white ceramics of the Yuan and Ming dynasties. They were painted with cobalt blue on a white ground before being glazed; blue is a fugitive colour and runs in the firing process, smearing the design. A turquoise border was often added, placed just outside the black line border. Similar tiles survive in situ covering the walls in the mosque and tomb of the Mamluk dignitary Ghars al-Din Khalil al-Tawrizi (d. 1430) in Damascus, begun in 1423. Elsewhere they are found in the mosque of Murad II in Edirne, north-western Turkey, built in 1435-6. They are sometimes interspersed with plain turquoise tiles. 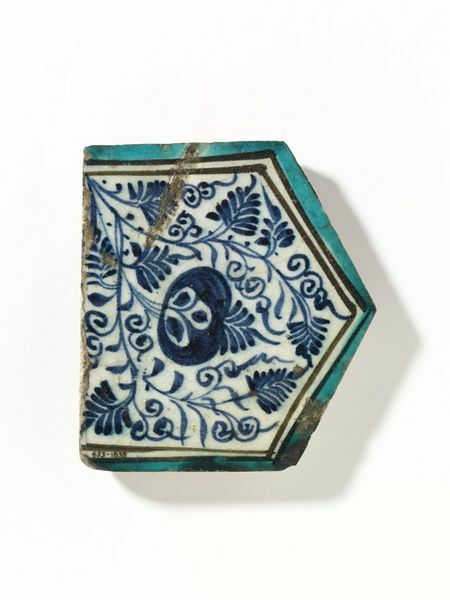 The blue and white Syrian tiles are not slavish imitations of Chinese designs, but rather a unique hybrid of Islamic motifs incorporating swaying leaves or arabesques. 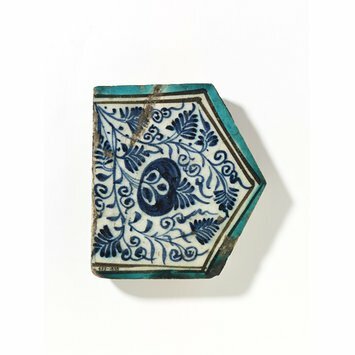 Tile, fritware, pentagonal (originally hexagonal), painted in underglaze blue with a scrolling floral design, framed with two lines in black, enclosed with a turquoise border. Lane, Arthur. A Guide to the Collection of Tiles. London: Victoria and Albert Museum, 1939, 2nd edition 1960. pl. 12.